The “Internet of things,” the “Connected Home,” the “Smart Home,” whatever you want to call it, it’s just a fancy way of turning your stuff on and off with your smartphone. Now GE has introduced a cheaper way to stay on the couch and control your lights. The low-cost connected Link lightbulb from GE will set you back less than $15. 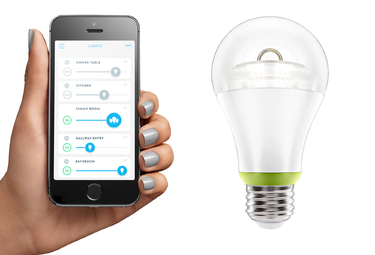 The bulb is controlled by the Wink app (available for iOS and Android) from Quirky. In addition to switching lights on and off from anywhere (not just your couch), the app lets you schedule things like on/off times and brightness. Smart bulbs are nothing new, but the less than $15 price point should help with adoption of the connected devices. For anyone that wants more control over their Wink-controlled devices, a Wink hub will be available July 7 for more control of a variety of connected devices including the Aros smart air conditioner. The Link comes in three flavors: A 60-watt replacement LED bulb for lamps; an LED indoor floodlamp and an LED brighter indoor/outdoor floodlamp. The $15 price is for the LED bulb for lamps. No word on what the other two lights will cost. The lights will be available for pre-order from Home Depot on Monday, June 30 and available at Home Depot stores this fall.